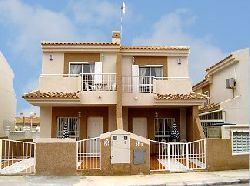 Lovely NEW 3 bedroom townhouse sleeps 6. [identical house next door so can sleep 13)Central Location .Car NOT essential.CLOSE to BEACHES, GOLF,Marinas ,SALT LAKES. The Patio is furnished with table 6 chairs ,sunloungers Parasols ,BBq Etc. .Easy access. Central location - car NOT essential. 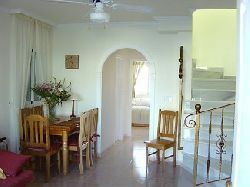 Buses nearby .5 mins drive to BLUE FLAG beaches, 5 mins walk to restaurants, bars, shops,Banks Supermarkets 5 GOLF courses. Ceiling fans in all rooms.Electric radiators. Cot and high chair Supplied. 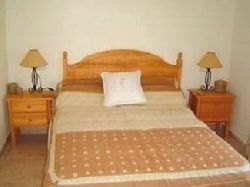 The lovely main bedroom is bright and airy it has Patio Doors which lead to a balcony furnished with table and chairs. [Great for a morning coffee watching the sun rise], A large wardrobe with drawers , bedside cabinets ,Table lamps A mirror, etc, SAFE fitted . The second bedroom is a Lovely sunny twin bedded room with asouth facing window that has a lovely view overlooking the pool and gdns.It Has A Large wardrobe, Drawers, Bedside Cabinets , Table Lamps etc. The downstairs bedroom can sleep 2 with wardrobe, drawers, etc This is a lovely sunny room which overlooks the pool& Patio area .It is very convenient for the less abled and childrens daytime naps [while you relax on the patio outside].Or adults siestas. There is also a convenient Cloakroom with Toilet and basin next door. There is also a large sofa bed (double). Sleeps 8 in total, plus cot. A high Chair is also supplied Ceiling fans in all rooms, Electric radiators Fitted Safe ,Hairdryer. Cot & High chair supplied. Ample bed linen, towels, etc. Downstairs bedroom and toilet/basin downstairs ideal for the less abled. Safe Blue Flag Beaches and shops, Supermarkets,Banks Restuarants, Bars very close,Aqua Park , theme parks (Terra Mitica),GOLF, sailing , riding.fishing, boating, Famous Salt Lakes. Nature parks all close by. The kitchen is separate from the living room - often they are not. The pool is visible (clearly) from the houses, so children can be overseen. The area around is fully established (not a building site). A car is not essential,Centrally Located. 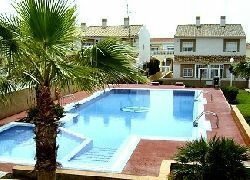 Close to airports ALICANTE- Murcia 30 mins Airport Pickups arranged.